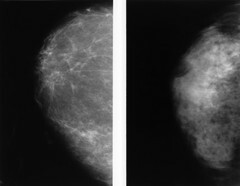 A side-by-side of two normal mammograms showing the difference between a dense breast (left) and a fatty breast (right). The dense breast is that of a woman aged 39, the fatty breast is that of a 59-year old woman. Abnormal lesions are easier to detect and diagnose in a fatty breast making mammography more accurate.